le Radio (DMR) is an international digital radio standard developed by the European Telecommunications Standards Institute (ETSI), and first ratified in 2005. 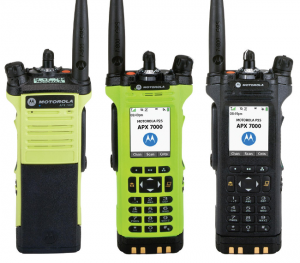 DMR stands for Digital Mobile Radio. It is a digital voice and data protocol that can be used unlicensed or commercially. You can peruse a standards document if you like. One of the major issues preventing you from using just any scanner from tuning to DMR is that the vocoder being used is AMBE, which is proprietary. Popular networks for Amateur Radio are the Brandmeister Network which is the largest Amateur Radio Digital Network in the World. Not an amateur, then feel free to listen in to their network and talk groups via the HOSELINE system which is free. The BM network consists of any DMR repeater that is available with network access. Motorola, Hytera or even a homebrew system, are all welcomed! Project 25 (P25 or APCO-25) is a suite of standards for digital radio communications for use by federal, state/province and local Public safety organizations in North America to enable them to communicate with other agencies and mutual aid response teams in emergencies. In this regard, P25 fills the same role as the European Terrestrial Trunked Radio (TETRA) protocol, but the two are not interoperable. The major difference between the two is P-25 is expected to work jointly with existing analog systems. Therefore, it uses “simulcast” method for control. “Simulcast” refers to the use of the same set of control channels throughout a given area, which are “simultaneously broadcast, or simulcast” in the region. In contrast, TETRA uses “Multicast”, which means the control channel is embedded, therefore there is no need to use a separate channel to broadcast control signals. TETRA provides 4 slots per channel, which means four voice calls can be handled on one channel. This is similar to the GSM cellular system, which contains eight slots with seven usable, allowing seven users per channel. D-STAR (Digital Smart Technologies for Amateur Radio) is a digital voice and data protocol specification for amateur radio. The system was developed in the late 1990s by the Japan Amateur Radio League and uses frequency-division multiple access and minimum-shift keying in its packet-based standard. There are newer digital modes (Codec2, for example) that have been adapted for use by amateurs, but D-STAR was the first that was designed specifically for amateur radio. Several advantages of using digital voice modes are that it uses less bandwidth than older analog voice modes such as amplitude modulation, frequency modulation, and single sideband. The quality of the data received is also better than an analog signal at the same signal strength, as long as the signal is above a minimum threshold and as long as there is no multipath propagation. D-STAR compatible radios are available for HF, VHF, UHF, and microwave amateur radio bands. In addition to the over-the-air protocol, D-STAR also provides specifications for network connectivity, enabling D-STAR radios to be connected to the Internet or other networks, allowing streams of voice or packet data to be routed via amateur radio. D-STAR compatible radios are manufactured by Icom, Kenwood, and FlexRadio Systems. System Fusion is Yaesu’s implementation of Digital Amateur Radio, utilizing C4FM 4-level FSK Technology to transmit digital voice and data over the Amateur radio bands. In the early 2000’s GMSK emerged in the Amateur radio market as the dominant digital mode, however in 2013 Yaesu introduced “System Fusion” which quickly became the dominating digital format in Amateur radio because of quality, reliability and enhanced performance in a wide range of environments. Digital Communication modes have gained popularity over the years in the market because of superior performance in environments with interference, noise and other contributing factors that degrade the quality of a standard FM Analog signal. 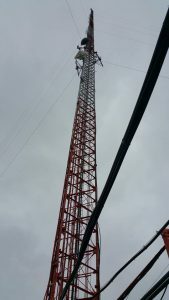 Narrower bandwidth and the need for increased spectrum have led to the development of digital communications technology, which has been widely adopted in the Public safety and private business sectors that use two-way radio technology. Unlike it’s commercial counterpart, System Fusion is an Amateur Friendly Digital Operating mode, straying away from some of the design considerations that make commercial solutions less appealing and more difficult for Amateur Radio Operators, providing a simpler interface and features that meet the demands and needs of the Amateur enthusiast specifically. Below you will find more information on this marvelous new technology, and how it can meet every operators demand and needs for a clear and simple Digital Experience. FreeDV is a Digital Voice mode for HF radio. You can run FreeDV using a free GUI application for Windows, Linux and OSX that allows any SSB radio to be used for low bit rate digital voice. Alternatively you can buy a SM1000 FreeDV adaptor that allows you to run FreeDV on any HF radio without a PC or sound card. If you are a hardware or software developer, you can integrate FreeDV into your project using the LGPL licensed FreeDV API. Speech is compressed down to 700-1600 bit/s then modulated onto a 1.25 kHz wide signal comprised of 16 QPSK carriers which is sent to the Mic input of a SSB radio. The signal is received by an SSB radio, then demodulated and decoded by FreeDV. FreeDV 700C is approaching SSB in it’s low SNR performance. At high SNRs FreeDV 1600 sounds like FM, with no annoying analog HF radio noise. FreeDV was built by an international team of Radio Amateurs working together on coding, design, user interface and testing. FreeDV is open source software, released under the GNU Public License version 2.1. The modems and Codec 2 speech codec used in FreeDV are also open source. Codec2 is a low-bitrate speech audio codec (speech coding) that is patent free and open source. Codec2 compresses speech using sinusoidal coding, a method specialized for human speech. Bit rates of 3200 to 700 bit/s have been successfully created. Codec2 was designed to be used for amateur radio and other high compression voice applications.